The Nawa flagpole holder attaches to a 25mm rail and holds a 25mm flagpole. The Talamex flagpole holders will hold 19mm and 25mm flagpoles. This excellent, stainless steel flagpole holder can be fitted vertically or horizontally onto a 25mm rail. This neat little stainless steel flagpole holder can be screwed to the deck. It is suitable for 19mm flagstaffs which are held firmly in place by a small pressure screw on the side of the holder. 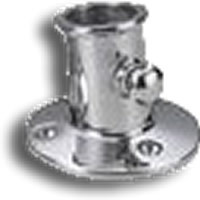 This flagpole holder is stainless steel and can be screwed to the deck. It is suitable for 25mm flagstaffs which are held firmly in place by a small pressure screw on the side of the holder.